We urge you to join the REvolution, a movmnt for the REgeneration. Movmnt Magazine is launching a new campaign in partnership with dance studios, conventions, competitions, and festivals to help bring awareness to our daily habits that pollute the Earth. Habits that can easily be changed by each and every one of us. As members of the artistic community, we have the duty to lead by example and stop using plastic bottles like kleenexes. We can refresh ourselves and recycle with one simple gesture: refill our own bottle. Movmnt introduces re:, an aluminium bottle that will not only save the environment, but also save you money. Buy your own bottle now for only $10 +$2 s/h to start the REvolution. Get involved with your community, Dance Studio, Competition, Yoga center, GYM, etc… and contact us to create a personalized bottle. Make re: available and become an environmentally conscious water drinker. With 29 billion plastic water bottles being consumed each year in the US alone, and of that 312 million are from dancers, it’s no wonder that studios and retailers are jumping for joy at Re: If just four towns per state offered Re: bottles instead of water bottles, 6,240,000 plastic water bottles would be saved. 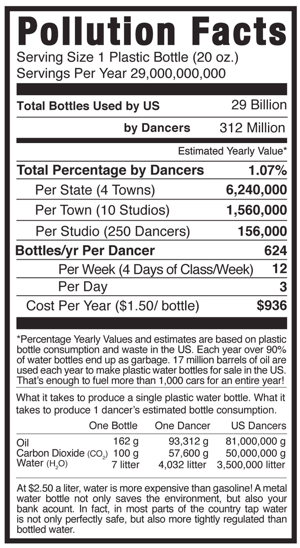 And, if 10 dance studios per town gave their dancers Re: bottles for one year, that would save 1,560,000 in wasted plastic bottles. A studio of 250 dancers can consume up to 156,000 water bottles per year, amounting to 624 per dancer or 1.07% of the overall water bottle consumption debacle. Over 90% of water bottles end up in the garbage every year, while 17 million barrels of oil are used to produce these plastic water bottles in the United States alone. That’s enough to fuel more than 1,000 cars for an entire year, or total a cost of $936 per year if you only drink an average of three bottles of water a day. At $2.50 a liter, water is more expensive than gasoline, making a metal water bottle appealing not only to the environment, but also to your bank account. There is no limit to how many times you can refill Re: as well as no limit to the amount of style you exude while sipping from Re:’s chic innovative aluminum design. In fact, in most parts of the country tap water is not only perfectly safe, but also more tightly regulated than bottled water, giving you a legitimately healthier reason to refresh with a Re: bottle. Re: is an aluminum refillable bottles come in four flavorful colors; sangria red, aquamarine blue, shimmery silver and forest green. They feature a wide mouth for easy drinking and come equipped with a carabiner clip that attach to backpacks, tote bags, dance bags and the like. Movmnt’s trendy designed available in 4 different colors is sold only RE’ cost only $10, for the same quality product generally sold in retail around $25. per bottle, although bulk orders are customized to specific events at a discounted price. For orders over 50 bottles, please see the contact information below. 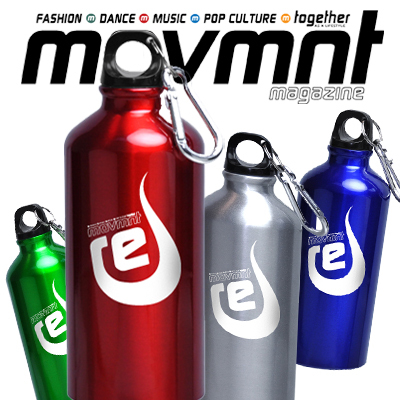 Movmnt is also partnering with retailers like Universal News, which gives them an opportunity to co-brand items like key chains, lanyards, bottle holders, and more. These accessories involve popular brands in the Re:sellable experience, and gives their logo high visibility with an eco-friendly edge and a pioneering body-conscious product. Movmnt does the legwork, the co-oping brand provides the artwork. When a company or dance studio wants to become a part of the RE initiative, Movmnt helps set up a cost effective fresh water station in order to economically refill RE. We urge you to join the REfillable aluminum bottle REvolution. 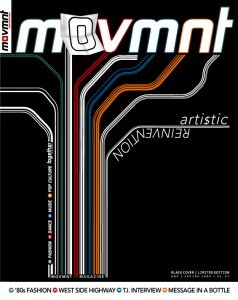 Movmnt Magazine is a quarterly publication printed in Vermont, USA on post consumer recycled paper. Movmnt magazine is a member of Green America’s Green Business Network. Members of Green America share ideas, resources, and support for creating a truly green economy.